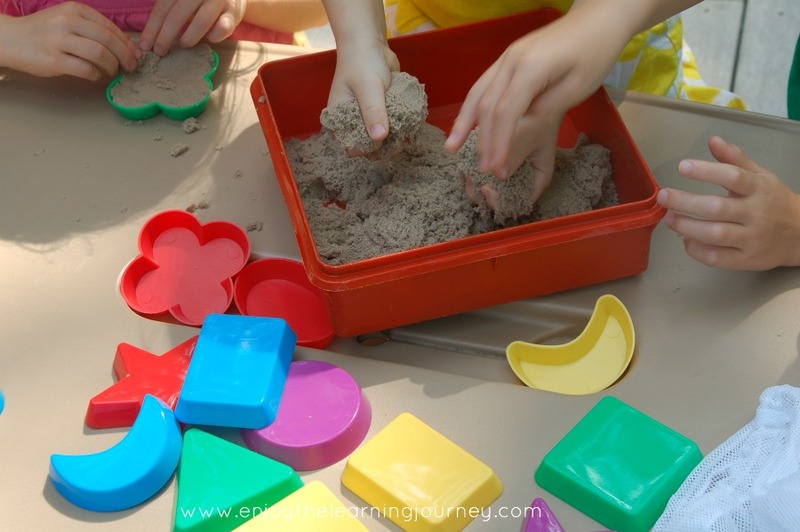 Our children discovered kinetic sand a few months ago when we were at our local Michael’s store where they had some on display. The kids kept touching it and I practically had to pull them away so we could leave. They begged me to buy them some. But it wasn’t on sale and at regular price it was more than I wanted to spend so I told them we’d have to wait. So as I was purchasing materials for our new school year, kinetic sand was on my list to buy. Although it’s not cheap, I think this will be used on a very regular basis at our house. Especially since there are lots of ways you can incorporate learning into it. 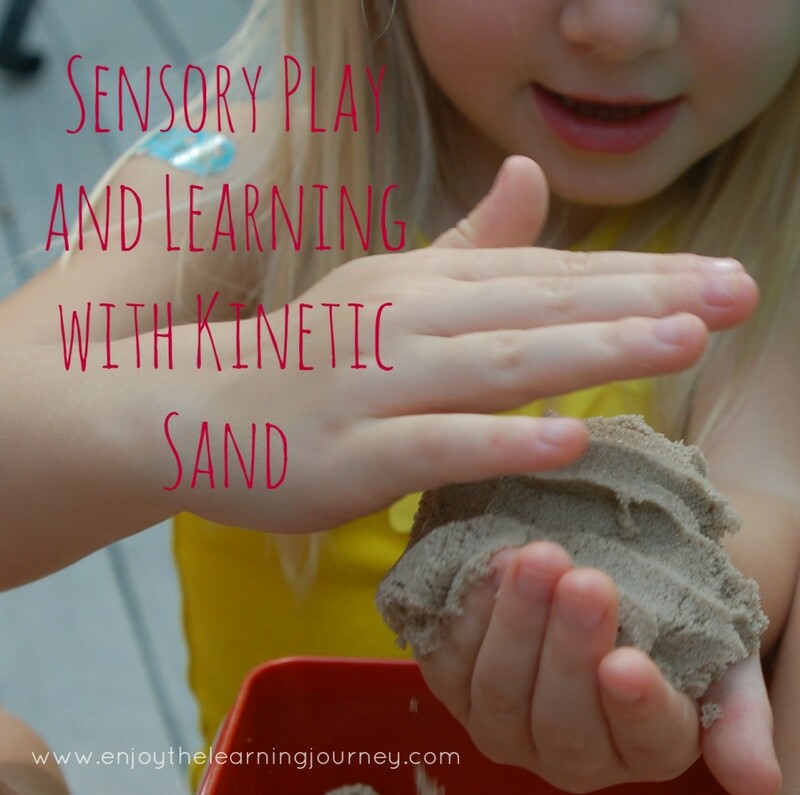 It’s more than just for sensory play. 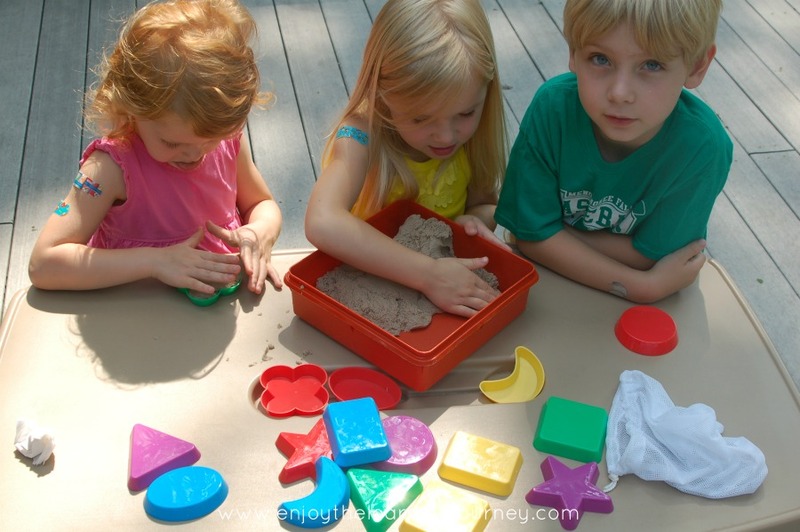 If you aren’t familiar with kinetic sand, it’s sand with a binder added to it so that it sticks together. 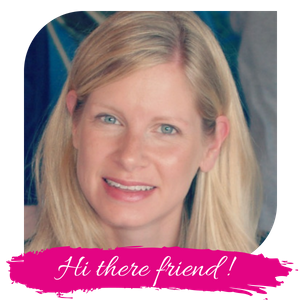 It feels neat and moves and shapes differently than regular sand. 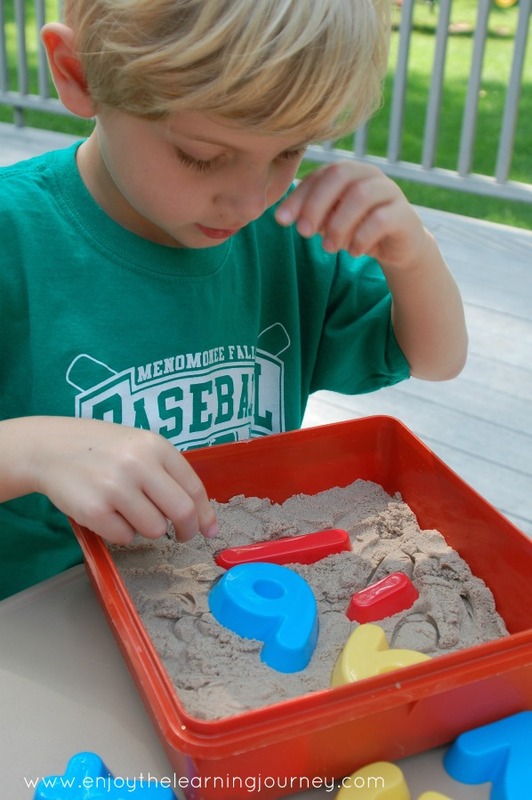 It can also be played with inside because it’s a lot less messy than regular sand. I purchased the 2 lb. bag and also purchased some learning tools to be used with it – shapes and numbers. 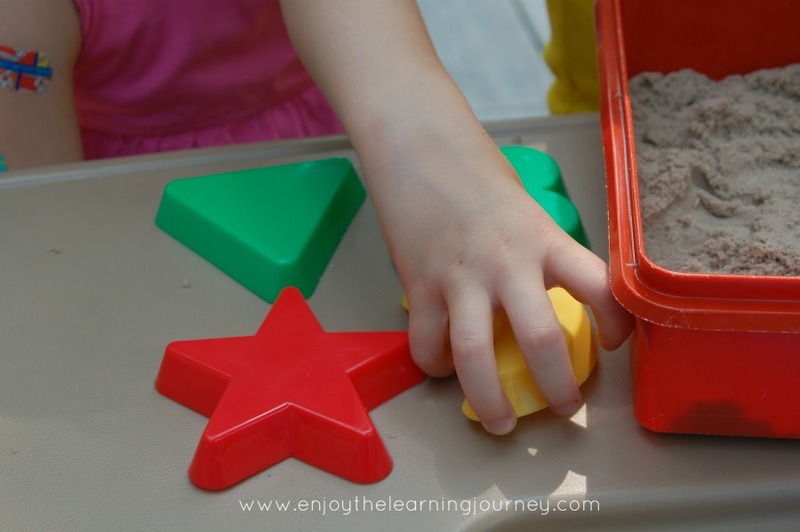 These Learning Resources Sand Molds are really good quality and should hold up very well. They also came with a mesh bag to store them in. After opening up our new bag of kinetic sand, I decided to store it in an old Tupperware container that we have. It’s the perfect size to hold the sand, and shallow enough for the children to easily put their hands in and it also has a cover for storage. 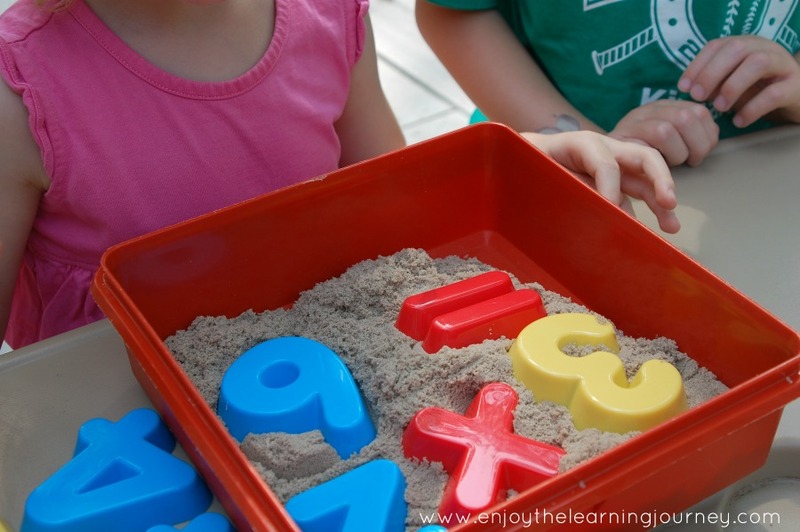 Once I put the sand in the container and got all the sand molds out, I first let the kids explore and just play on their own. I quickly realized that having one container of sand is going to be a problem as they were all grabbing for it and arguing over who should have the container in front of them. They worked it out though (for the most part) and played for quite a while. After introducing the sand and allowing them to openly play, I worked with the girls on shapes, colors and following directions. I put four shapes in front of them and then asked them to make a shape in the sand with a specific shape such as the triangle or the crescent or the purple star or the blue square. I continuously switched out the shapes in front of them and asked them to pick a different one each time. This was pretty easy for them but they had fun with it anyways. Then we switched to numbers and did the same thing. With Snootz, we worked on equations in the sand. 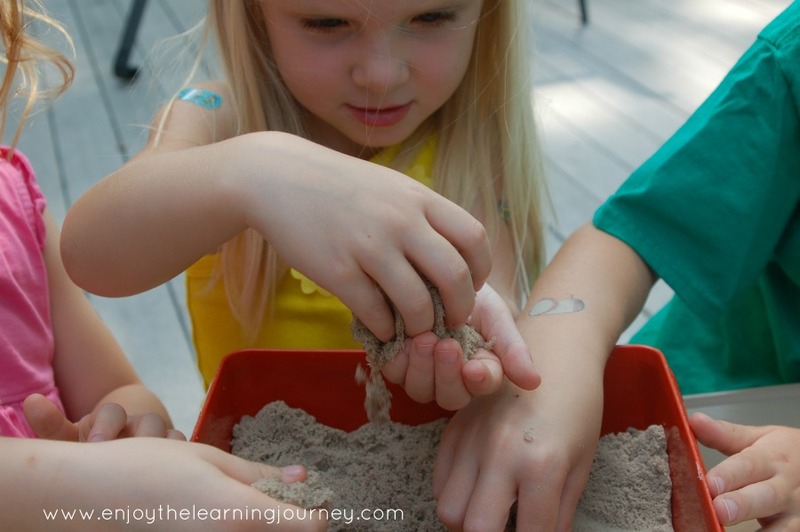 There are so many options and ways the sand can be used for learning. I am sure we’ll do a lot more with it this year, including using it as a reward for when they complete their work.